I feel such a strange mixture of emotions right now; the Harry Potter journey, which I embarked on as one of the very first readers way back when I was seven, is over. Harry Potter and the Deathly Hallows Part 2 is a fantastic conclusion, like the book it’s based on, but one can’t help feeling overwhelmed once it’s all over. So overwhelmed, in fact, that you are now reading my fourth attempt at starting this review, and one of those attempts reached two pages before I scrapped it all and started over from scratch. It’s difficult to write about Hallows 2 because there’s never been a film quite like it, just as there’s never been a series like Harry Potter. No film series has ever had ambitions this high, attempting to tell one sprawling story over a decade’s worth of films using the same set of growing actors throughout, and that means that no film series has ever had a conclusion quite like this. 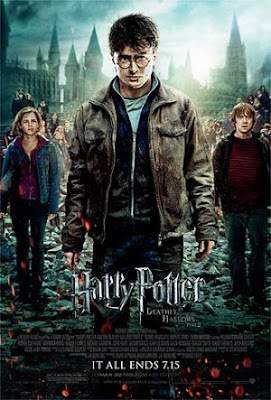 There is so much for the filmmakers to play with in this final chapter, so many character arcs and story threads to bring to a close, and from start to finish, Hallows capitalizes on everything that has come before, crafting a finale that sends the universe, the story, and most importantly, the characters out on a high note. The film picks up right where Part 1 left off, with a start abrupt enough to underline how much this is just one four-and-a-half hour film split in two; indeed, they play best back-to-back, where starting in the middle doesn’t feel disorienting. Harry, Ron, and Hermione are right where we left them, mourning the death of Dobby at Shell Cottage on the beach. Having lost another friend, Harry’s resolve is stronger than ever, and he immediately starts plotting to find the next Horcrux, which this time means breaking into Bellatrix Lestrange’s vault at Gringotts. It’s a very fun sequence, highlighted by another bit of Polyjuice Potion antics: Hermione transforms into Bellatrix for the heist, and Helena Bonham Carter does a mesmerizing job playing Emma Watson; her mannerisms, the way she holds herself, the innocent expression on her face – it’s all perfect, and at first, I was sure they had simply put make-up on Emma Watson and stuck her in Carter’s costume. It’s one of the most convincingly magical scenes in the series, as is the epic dragon flight that climaxes the Gringotts heist. From there, it’s off to Hogwarts, as Harry realizes that Voldemort has learned the trio are after his Horcruxes. There’s no time for hesitation any more – the last Horcruxes are at Hogwarts, and Voldemort has brought an army along with him to stop Harry Potter. No matter what the outcome, this battle will be fought and finished in one climactic night. And what a night it is; director David Yates has proven to be a perfect Harry Potter director because of how well he understands the characters and their relationships, but he’s also an extraordinary visual craftsman. This part of the story asks him to do more than ever before with both of those talents, and he rises to the occasion spectacularly, staging a Battle of Hogwarts that is both grand and intimate. There is so much action and chaos throughout the picture that, under a lesser director, it would be easy for the characters to get lost in the confusion. Yates, however, maintains clarity throughout, and as awe-inspiring as some of the action is, he never forgets that the character moments are more important than the explosions. Yates and screenwriter Steve Kloves understand these characters so well at this point that they are able to give nearly every member of the vast ensemble a terrific, applause (or tear) worthy final moment without resorting to hokey fan-service. As well as the supporting cast is utilized, the real strength of the adaptation comes in the handling of the core characters. Yates and Kloves wisely keep the action focused on Harry for most of the battle, meaning much of the action happens off screen as Harry hunts down the final Horcruxes. While it would be tempting to give the film a Lord of the Rings style treatment and go all out showing every moment of the battle, focusing on Harry means that when he walks through a room full of dead friends and loved ones, we share his shock and grief, and fully understand the decisions Harry has to make. Putting Harry front and center means Yates is asking Daniel Radcliffe to carry the entire film on his shoulders, something Radcliffe does with ease. His performance is fantastic; from the intense and angry moments to the quiet, grief-filled ones and everything in between, Radcliffe does flawless work. In particular, his two scenes opposite Alan Rickman’s Snape demonstrate Radcliffe’s impressive range. I’ve always felt he was the perfect choice to play Harry Potter, but here, he resembles the wizard of Rowling’s text more than ever before, all while leaving his own distinctive, iconic stamp on the character. Despite Harry’s prominence in this chapter, Yates and Kloves don’t forget the importance of Ron and Hermione, and while Rupert Grint and Emma Watson got their biggest showcase moments in Part 1, they still shine very brightly here. As in part 1, Grint proves that he can do a whole hell of a lot more than comic relief, and the immeasurably talented Watson still gives the film its heart and soul. Few groups of characters in cinematic history have had this much chemistry, and the trio’s friendship is handled beautifully here, even giving them moments beyond what Rowling wrote. Yet the character who walks away with the movie this time around is none other than Severus Snape, as we finally learn all the details behind his tragic past in an expertly constructed six-minute flashback sequence. Simply put, this is one of the greatest scenes I’ve ever seen committed to film, a masterpiece of structure, editing, and most importantly, acting, as Alan Rickman gives a performance that completely and organically changes the audience’s perception of Snape. As wonderful as this moment is in the book, seeing it dramatized gives it a whole new sense of weight, and if I were to choose one scene from the entire franchise to explain why Rowling’s books deserved to be films, it would be this sequence. Talking about too many more characters in-depth will lead us spiraling out-of-control down a very long rabbit hole, such is the scope of this ensemble, but let me touch upon a few more: Ralph Fiennes does his best work yet as Voldemort, displaying a vulnerable side that only makes him that much more frightening. Suffice it to say, Fiennes’ Voldemort will go down in history as one of the great cinematic villains. Matthew Long, who has consistently done fine work in the background as Neville, does a great job here with a dramatically expanded part, while Evanna Lynch makes the absolute most of her limited screen-time as Luna. Dame Maggie Smith’s brilliant portrayal of Professor McGonagall has always been one of my favorite parts of the franchise; Yates and Kloves clearly share my opinion, because they’ve kept in every one of McGonagall’s scenes from the book and added in a couple more just for good measure. My auditorium clapped for McGonagall no less than three times. And one can’t forget Michael Gambon, who delivers his final, post-mortem scenes as Dumbledore with so much grace and warmth that it’s hard to keep a dry eye when he’s on screen. Fans of the novel will know what I’m talking about when I mention the “King’s Cross” scene, a sequence that has been brought to life flawlessly in the film, with Gambon perfectly delivering some of J.K. Rowling’s very best dialogue. The cast goes on and on; Helena Bonham Carter, Tom Felton, Warwick Davis (who shines in the first act as the goblin Griphook), Robbie Coltrane, Jason Isaacs, Gary Oldman, David Thewlis, Julie Walters, and newcomer Ciran Hinds as Dumbledore’s brother Aberforth. I could spend days discussing the perfection of this cast, and Hallows Part 2 sends each and every one of them out with a bang. The only character I’ve ever felt didn’t work in the film franchise is Bonny Wright’s Ginny; Wright is far too low-key and bland to play someone Harry would be attracted to, and she shares no chemistry whatsoever with Daniel Radcliffe. Yates and Kloves seem to have recognized this, as they keep Ginny’s presence at an absolute bare minimum, putting all the film’s romantic responsibilities on Ron and Hermione (who got at least five rounds of applause from my audience). 1 miscast out of 70 billion characters isn’t bad. From a technical standpoint, Hallows is simply flawless. Production designer Stuart Craig is the unsung hero of this franchise, having designed all the iconic sets we’ve come to love so much. Apart from a redesign of Gringotts, there aren’t too many new sets here; instead, Craig gets to have fun demolishing all his old locales. The sight of a decimated Hogwarts is both heartbreaking and awe-inspiring. The special effects are so good that one hardly ever notices them, and there are more effects here than ever before. CGI has come a very long way since Sorcerer’s Stone, but Yates also stages plenty of sequences practically to keep the illusion of reality alive. Eduardo Serra’s cinematography is identical in style and color scheme to Part 1, and looks as gorgeously bleak as ever. Then there’s the music, once again provided by composer Alexandre Desplat; I already reviewed this score in some depth in this article, and everything I said there holds true. This is a beautiful, thrilling, and at-times unbearably emotional score, with Desplat’s compositions often providing the tipping point for tears. Overall, I think I preferred the music of Desplat’s predecessor, Nicholas Hooper, but Desplat was absolutely the right composer for this film, and he does an especially good job resurrecting the classic John Williams themes. In particular, the epilogue sequence uses the exact piece of music I was hoping it would, and I think fans will be thrilled to hear it. Harry Potter and the Deathly Hallows Part 2 is the culmination of so much, and it doesn’t once fumble the ball. One of the hardest things for me to put into words is the emotional effect a film has on me, and that makes this a very hard film to review. Suffice it to say, you will experience a large gauntlet of emotions as the series draws to a close. My audience burst into applause at least a dozen times throughout, evidence of the kind of satisfying, exhilarating moments the film has to offer. Everybody in the theater seemed to cry at least once, and always at different things; the Resurrection Stone scene is the one that broke me. I’ve never cried so hard in a movie. There is laughter, there is suspense, there is triumph and defeat, blinding, bewildering joy and crushing, unfathomable sadness, with another world of emotions in between. For me, the success of the picture – and, by extension, of the entire eight-film franchise – is summed up in one sequence, and to discuss it will require some spoilers. You’ve been warned. Before cutting to Rowling’s infamous epilogue, set nineteen years later as Harry, Ron, and Hermione send their own kids off to Hogwarts, the trio begin to walk away from the ruins of Hogwarts. They clasp hands and slowly close their eyes as the scene fades to black. This moment, not found in the book, initially confused me; it was as if the trio were bracing themselves for something else to come, and I could quite figure out what. When I got home and began working on my review, I found that I felt empty inside. I was obviously emotionally drained from the experience, but it was something more than that. Harry Potter has been an incalculably large part of my life since I was seven, since his initial adventures on the page helped me deal with the grief of my grandparents’ passing and the fear of starting Elementary school. That was only the first of many things Harry did for me. I would not have become a writer were it not for J.K. Rowling, and I would not have fallen in love with cinema if Warner Bros had never brought her books to the screen. I felt empty because, as satisfying a conclusion as Deathly Hallows the film is, there’s no more hiding from the fact that Harry Potter is over. In one month, I head to college and the next chapter in my life, and for the first time since I was seven, Harry won’t be there to guide me through this step in the journey. Growing up with Harry Potter meant one always had a friend and role model, someone to look up to, to learn from, or to find solace in, because Rowling understood all the pain, joy, and subtle enigmatic emotions that come with growing up; by extension, the films understood this too. Growing up was always just a little bit easier when you had a story like Harry Potter to turn to in the darkest, most confusing moments. But Harry’s journey stops at age seventeen, and there isn’t a college equivalent of Hogwarts. From here, our paths diverge, and Harry becomes nostalgia. The thought scares me – what do I do when I turn to Harry and find that he can no longer help me? But then I think back to the final scene of the film, and I realize why Harry, Ron, and Hermione closed their eyes, clasped hands, and braced themselves for some unknown challenge – they, like us, have reached the end of a very long journey, but are smart enough to know that their lives are still only just beginning. They still have a long way to go, as do we, and it’s impossible not to feel afraid and empty at this realization. That moment is aimed directly at lifelong fans like me, and it’s a moment that seems to say it’s okay, we understand, one last moment of empathy between the characters and the audience. And that moment makes the epilogue resonate all the more powerfully, as it leaves us with a message of hope for all who feel empty at the end of the Harry Potter saga – life can be scary and unpredictable and devastating, but with time and perseverance, everything will be alright in the end. All will be well. As I realized what this scene meant, I felt the emptiness inside my heart begin to lift. Harry may be gone, but he left by acknowledging his departure, prompting us to continue our journeys without him with grace and dignity. In that way, the filmmakers achieved something that J.K. Rowling herself couldn’t – they crafted an ending as meaningful and satisfying as everything that came before it in a moment that sums up everything the films have done right. More than anything else, that guarantees the film a spot on the classics shelf alongside the novels, and that’s what the “plus” in the A film grade represents. God knows this movie, and this franchise, deserve it. Jonathan, you are a phenomenal writer. I don't think I've ever gotten teary-eyed from reading a movie or book review, but you just did it. Bravo.